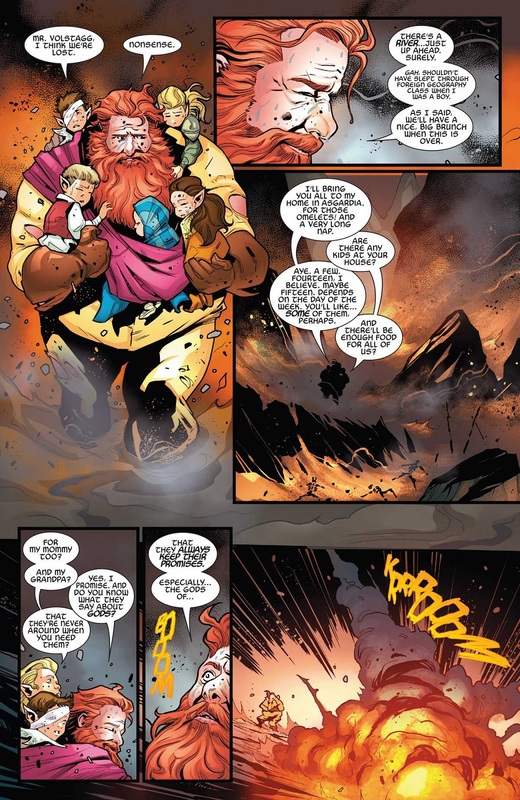 Was anyone seriously asking for a Grim and Gritty version of Volstagg? Seriously? We're going with this. Seriously. Seriously. I don't think I care about classical mythological accuracy here anymore than I do in Wonder Woman. This is bloody VOLSTAGG!! they're grim-ifying.... The one damn CHEERY Asgardian with a happy family life. This was solicited with a white-bearded War Thor. A Thor with a red beard. Not just the white beard. In the solicits, War Thor's right eye was shadowed, implying that maybe he didn't have one. So Aaron's still pushing the bit about Thor being a title over an actual name. I agree with you. Passing on codenames is fine, but treating someone's real name as if it was a codename or title is just weird, god or not. Let's say you have this friend named John Smith, who gets fired from their job. Then the person who is hired to replace your friend shows up wearing your friends clothes, acting like your friend, and insisting you call them John Smith. It would be weird and uncomfortable as hell. I'm honestly surprised any of the heroes who are friends with Thor trusted Jane to any degree. I like that the kids are a Power Pack easter egg (if in hair only). After a tragic loss, our title character who is normally a jovial, adventurous sort, is now reborn as a hard edged bloke ready to do what is needed to prevail in times of war. He's not who he was, but now he's... the War Doctor. Wait, I meant War Thor. War Thor! "He's making Doctor Who references at you!" "THAT IS A LIE! I DO NOT EVEN KNOW WHO TOM BAKER IS! Coming soon: an epic team-up between 60s Thor, Simonson-era Thor, Lady Thor, Grim'n'Gritty Future Thor, War Thor, Ultimate Thor and Thor Thor Thor of Thor, the Fourth! ... but in all serious, when did Ultimate Thor's hammer work like that? So why... urgh. Never mind. It's Jason Aaron. The answer would only confuse and irritate further. It's not the Mjolnir he had by the end of the Ultimate Universe, it is the one U!Thor used during "Secret Wars" and given to him by Doom. Like all the other Thors in that story, he had a proper Mjolnir. When he died during the final battle and the Universe was restored, his Mjolnir reached the new Universe. 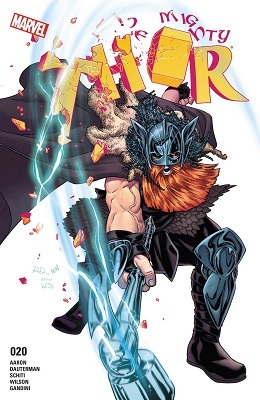 Who else noticed that the cover is a ref to Thor vol.1 #337? 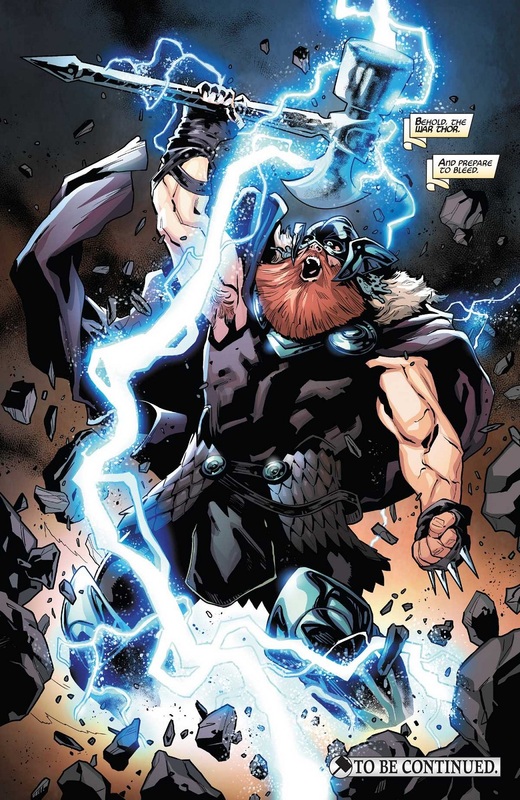 If Volstagg is Worthy to wield Mjolnir, he can't be driven by mere anger or thirst for revenge. He is a jovial character, and part of that has always been that his fatherhood means that he has a soft spot for children. To have the children he was trying to save killed by the evil forces spreading across the land drives him to make war on those forces by taking up the Mantle of Thor, but remember that he is motivated to make war in the name of protecting the innocent that those objectively evil forces would destroy. It's less morally nuanced than what we're used to dealing with in the real world, but this is Asgard: a land where Myth is made manifest. I am excited to see how this plays out. If you think the Big Man won;t be cracking jokes with other Thors before too long, you're kidding yourself. Leaving aside the weirdness of "Thor" somehow being a title that can be acquired rather than a birthname, if he was the Justice Thor, or Nemesis Thor, I might be more inclined to give that benefit of the doubt, but War implies destruction, rather than balancing the scales. If he does end up cracking jokes, it will be very odd, since he's motivated by the death of children. I get the feeling that I'm in the minority, but I like this. Recall that Volstagg was not worthy to lift Mjolnir when it was on the moon. He only became worthy (of a different Mjolnir) after watching children in his care get slaughtered. It's long been implied that Volstaag was once a great warrior, but age and fatherhood have rendered him slothful. Dead kids would enrage anyone, especially someone with a daddy mindset. So the rage doesn't make him worthy per se. 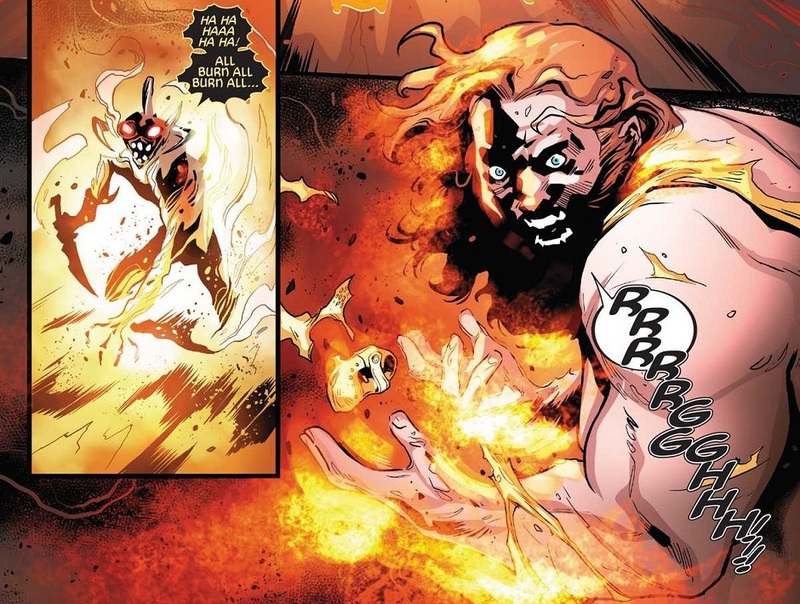 Rather, the rage burns away the inertia that kept Volstagg from being worthy. Yeah, but the writing and art will fluctuate wildly between "good" and "ehhmm". The cover reminds me of a 90s-era cover with Blood Axe. Maybe it's been done with other Thor covers? It's drawn identically to the cover of the issue that introduced Beta Ray Bill. 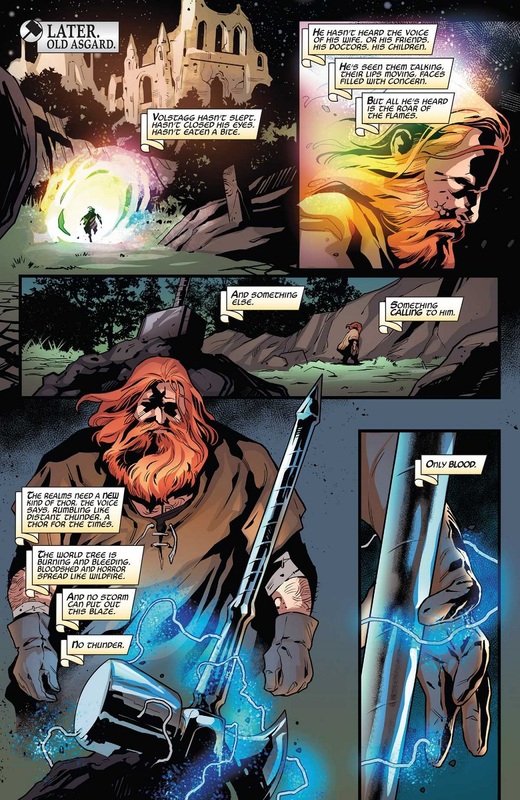 To people worried about Volstagg's characterization, let's keep in mind this is the START of this story arc, which will most likely involve Odinson and Thor having to reach out to Volstagg to pull him away from this self-destructive path. My concern isn't just about the characterisation, it's about the authorial choice to use Volstagg as the character to do this story about in the first place. 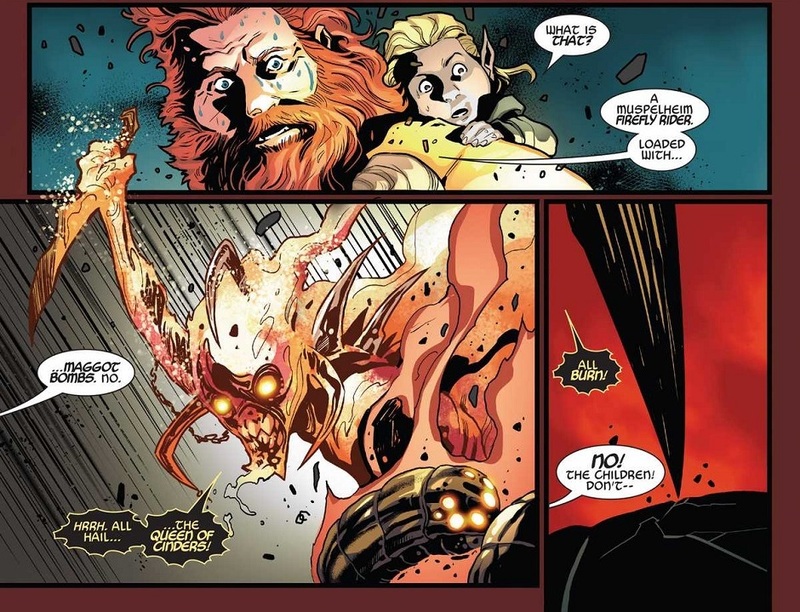 Sooo... it's not quite a "Break the Cutie" moment, since this is Volstagg we're talking about. Maybe, "Break the Bear?" And as horrible as the death of children is, at least it was some random elf-kids and not, say, Hildy. Maybe I should give Jason Aaron's Thor run another try- NOPE, never mind.